Shitsco CTF Problem Walkthrough – Shevirah Inc.
I’ve decided to start this blog to post some of my work. My goal is to make everything understandable to someone who has read the exploit development chapters in my book and/or did the exploit development exercises in the OSCP course and exam. I find that even with years of study I sometimes fall into the gaps of assumed knowledge and skipped steps on vulnerability write-ups. What I’ll try and do different here is make everything I post go step by step and include all the background. That might make it really boring to some of you and I apologize, but that’s the kind of blog I want to have. I’ve been working on bug hunting and will post some write-ups of my first couple findings as soon as the responsible disclosure window runs out. In the meantime, I’ve also been dusting off my skills by working through some old CTF problems. This particular post will be about a CTF problem from the Defcon CTF Qualifier in 2014. There are already other write-ups on this problem including here and here. Again my goal here is to do the walkthrough in such a way that someone who is just developing their skills in exploit development and reverse engineering would be able to understand and follow along with me. Certain people expressed that my writing a book about penetration testing when I did not invent penetration testing, covering the use of tools I did not write, and writing exploits for vulnerabilities I did not discover was shameful and even amounted to plagiarism. Then again countless people have written me that my book allowed them to get into infosec, helped them pass their OSCP, etc. so I will attempt to use this blog to continue in the same vein, haters be damned. Anyway, download Shitsco to your 32 or 64 bit Linux system. Shitsco is a dynamically linked 32-bit binary so if you are using a 64-bit platform you will need to enable multiarch-support and install i386 specific libraries. The commands will vary from platform to platform and even version to version, but on my Ubuntu VM this worked. To use Shitsco locally, you’ll need to create an account shitsco on your Linux system with the home directory /home/shitsco. In that directory create a file called password and put a word there. Be sure not to include a newline at the end like in the console output shown below. You can use the -n flag in the echo command to not put the trailing newline character. The lack of newline is significant as we will see when we analyze the binary code. If we have a newline it will be read in as part of password global variable. But when we enter a password a newline will signify the end of our input and not be included in the password. For my example I’m using foobar as the password. Now promptly forget the password that you created, as one of our goals will be to figure out the password using exploitation. In the actual CTF the password file was set up for you on the target box. Amusingly enough I happened to be working on the Shitsco problem while I was in the audience waiting for my keynote at Cisco’s internal Seccon conference. I had not gotten the hint from the name, but it did occur to me when I ran the binary for the first time. Before I start any kind of reverse engineering I like to get familiar with the binary’s functionality. Anyone who has done any network device pentesting or IT work is probably familiar with this dialog. One thing that popped right out at me is the shell command. Given that this is a CTF problem, I doubt it is that easy. But there is no harm in trying. The binary throws the shell prompt but after a few seconds it says “Yeah, right.” and returns to the regular prompt. So as expected we will need to work a little harder to get the shell. From my previous experience with Cisco equipment I know the enable command leads to administrator access. By default on some models the default password is blank, but that was not the case here. Nor is it cisco. I was pretty sure it wasn’t georgia, but trying it introduced me to what looks like our first bug. Nope. The password isn’t georgia? ?m???`?8Z?`??o????? What we are seeing after our password attempt printed back at us appears to be leaked memory. Since C strings are NULL terminated, printf (the C function we will see used in this piece of code) will print each character of the designated string until it reaches a NULL byte. Thus if a string is not NULL terminated, printf will not know where the string ends and additional characters will be printed that are out of bounds of the string. While currently we just see garbage, perhaps we can take advantage of this to read interesting information from memory. But before we dive into the reverse engineering to get more info on this bug and hopefully build an exploit for it, let’s look at another pair of commands that takes user input (places ripe for bugs). The set command allows you to set a key value pair. You can use the show command to view a particular entry or a list of all the key value pairs you have set. No doubt these are stored in memory as some sort of linked list, the kinds of things I was supposed to learn how to make in data structures class. But really what you need to know about linked lists as a bug hunter is that they have certain side cases that must be properly addressed to avoid bugs. We will look at the set/show issue in the next installment and focus on the memory leak with enable in this post. My typical practice when working on these problems (for education purposes, naturally not when working against the clock during a CTF) is to follow Roger Ascham, tutor to Elizabeth I of England’s, practice of having pupils translate Latin texts to English and then back to Latin again. Taking a binary, I reverse engineer it completely and then turn my reverse engineering back into working C code. Ideally the resulting code when compiled will function identically to the original binary. For the reserve engineering portion I use IDA Pro. For an independent researcher new to reverse engineering, the price tag may seem a bit daunting. But I encourage you to take the plunge. You do not need to purchase the even more expensive Hex-Rays decompiler for this exercise. In fact, if you do have the decompiler, I encourage you not to look at the output until after you have completed reverse engineering and translating the output back into C code. Then it may be helpful for you to compare your results to the decompiler output if you do have it. If you are unfamiliar with IDA Pro I’d suggest picking up a copy of Chris Eagle’s The IDA Pro Book and diving in with a problem like this one. After opening the binary in IDA pro, I look on the left in the functions list for the function main. I personally prefer the straight disassembly view many reverse engineers prefer graph view as shown in the screenshot below. You can toggle between the two with the space bar. You can make comments directly in the disassembly with the ; key. You see some comments in my disassembly, but I actually prefer to go straight up old school and take notes with pen and paper. Whatever works best for you. Looking at the first few lines of the disassembly for main we see the typical stack frame setup followed by the stack cookie getting set ⓿. The stack cookie or canary is an anti-exploitation technique. A random value is put at the end of the stack frame before the saved return pointer. Before a function returns, the saved stack cookie is compared to the saved value in the data section. If the canary is incorrect it’s a sign that a buffer overflow attack has occurred and the program terminates before the function can return and EIP is potentially hijacked. A couple lines below the stack cookie setup we see a couple variables in the data segment being set ❶. ds:byte_804C380 is set to 24h (36) and ds:dword_804C3C0 is 0. You can double click on those variables to be transported to their location in IDA view (and ESC to return whence you came). You can also press N to change the name of a variable. Once we figure out what variables seem to be for, what functions seem to do, etc. it will help us understand the program to change ds:dword_804C3C0 to something more human readable. Next we see call sub_80489D0❷. Double click on the function name to move into it. So we’ve got a relatively short function here. At the top before the disassembly we see information about our stack variables ⓿. You can also press Ctrl+k to see a stack view. At ❶ eax is set to 0. Then at ❷ we see another data segment address[eax] set to 0. Then we add 4 to eax and compare eax to 24h (32). You may not be familiar with the JB conditional jump ❸. It is like JL except it is an unsigned comparison. If you are unfamiliar with unsigned vs. signed integers I recommend you read up on them as switching between the two is a common root cause for bugs. Anyway, if eax is less than 24h(32) we jump back to the label at ❹. So now eax is 4 and we set ds:dword_804C3A0 to 0. So basically we are zeroing out 32 bytes of memory in the data segment 4 bytes at a time. After eax is equal to 24h(32) we exit the loop and continue on. Next we are moving some local variables to the top of stack. It may look a little weird but if you do the math, at the beginning of the function we see filename = dword ptr -1Ch and here we have [esp+1Ch+filename], offset filename. So we are moving the offset filename into esp and offset modes into esp+4. In x86 binaries, function arguments are stored on the stack. If you’ve worked primarily with x64 or ARM you are probably used to arguments being stored in the registers. So the filename (“/home/shitsco/password”) and the mode (“r”) are the arguments to the next function call fopen at ❻.
Fopen is a built in function in libc.. You can read about it with man fopen on a Linux system or just Google it fopen. As expected from the arguments fopen takes a filename and an access mode. It returns a FILE pointer. So the binary is opening /home/shitsco/password (the file we created during setup) for reading. The return value of a function is stored in eax. Right after the call to fopen we see test eax,eax. If eax is 0 the zero flag (ZF) will be set. Looking back at the man page for open we see it returns NULL (0) if there is an error. So we are making sure that fopen was able to open the file for reading. If eax is 0 we jump to ❼. Then we use the perror built in function to write that we could not open the file and exit the program with status 1. Otherwise, if fopen returns a nonzero value we set up the arguments for fread❽ on the stack. From fread’s man page fread we see it takes a pointer to read the data into (offset dword_804C3A0), number of blocks to read (1), number of bytes to read in a block (24h), and a file pointer to read from (ebx which is where we saved eax after fopen). So we will read 32 bytes from /home/shitsco/password into the data segment memory we zeroed out at the beginning of this subroutine. Clearly dword_804C3A0 is where the password is being stored. To make it easier on ourselves later, let’s select dword_804C3A0 and press N to rename it to password. That way if we encounter it in another function we will know what it is. Right after fread returns we have another test eax,eax. Fread returns the number of bytes read. If 0 bytes were read we jump to and unwind the stack ❾ by adding 18h (24) to ESP and return to main. Otherwise we do an fclose on ebx(the FILE pointer to /home/shitsco/password) before the unwind and return❿. One thing I thought was interesting was according to this if the file can be opened but cannot be read, the program will continue with the password memory location set to all 0s. In a real CTF scenario we will not have access to the password file anyway, so let’s move on towards the potential bug in the enable function. A C code equivalent of read_password would be something like the code shown below. We can press ESC to return to main where we left off. You can use N to give the subroutine a human readable name such as read_password. Our next few instructions in main are shown below. Back in main we use the puts⓿ function to print the Shitsco ASCII art to the terminal. If you double click on the offset s, you will jump to the data section and can see the entire string. As usual use ESC to return to where we left off. Then we compare ds:dword_804C3C0 to 1 . Recall we set ds:dword_804C3C0 to 0 just before the call to the read_password subroutine so it is definitely not 1. Next we are setting up arguments on the stack again. This time we have the next piece of the prompt. Click on aWelcomeToShits to see the full prompt string. Notice at ⓿ we see %c. If you are familiar with formatted output functions in C you may recognize that as a character variable. So the final character in the prompt may change. Back in main, though we just set up two arguments we do not immediately see a call to a function. The SBB instruction ❷ is integer subtraction with borrow. It adds the second operand and the carry flag (CF) and subtracts the result from the first operand. To find the value of CF we need to look a little deeper into how the CMP instruction ❶ works. CMP subtracts the second operand from the first and sets the EFLAGS register as the SUB instruction does. We know at this point ds:dword_804C3C0 is 0 so cmp ds:dword_804C3C0, 1 is really cmp 0,1 which is 0-1 = -1. This will set the carry flag. Thus the SSB instruction is really eax – (eax+1) = -1. Next at ❸ we have not eax. -1 is 0FFFFFFFFh so a not makes eax 0 as all those true bits become false. Then we add 24h to eax and move it to esp+8 to join the other arguments we set up previously. At ❹ we run printf (the ___printf_chk you will see a lot and you can consider it just compiler optimization) with the welcome to shitsco prompt and 24h as arguments. Recall the %c in the data section. That’s where our 24h comes in. If you aren’t great with hex to ascii conversions check out a site like http://www.asciitable.com/. Sure enough 24h translates to $, which is exactly what we saw as prompt when we first ran the program. If you’ve any experience with Linux command prompts in general you can probably guess that the alternative for the prompt is #, for a privileged shell. Just for the sake of argument let’s follow the path that would print a # instead of a $. If ds:dword_804C3C0 is set to 1 then the CMP at ❶ becomes 1-1 = 0 and the carry flag is not set. Thus the SSB at ❷ is eax – (eax + 0) = 0. The not eax at ❸ does a bitwise not on 0 which turns it into all 1s or FFFFFFFFh (-1). Thus the add eax, 24h sets eax to 23h which in the ascii table is #. So it stands to reason that ds:dword_804C3C0 is basically our “is root?” variable. Then we jump down to 0804888F. The REP STOSD ⓿ instruction stores the dword eax at edi, ecx times. Esi was xored with itself to make 0 a few lines before, and is now moved into eax. Ebx is moved into edi. Ebx was set with lea ebx, [esp+1Ch] earlier in main. LEA short for load effective address will as the name implies load the address of esp+1ch into ebx. Recall the read_password subroutine used the ebx register to store the file pointer for /home/shitsco/password from fopen. However, at the beginning of the subroutine we saw push ebx and right before the return pop ebx, thus ebx is not changed. So we write a dword of 0 to esp+1ch 14h(20) times. Now we set up the arguments for the next subroutine call❶. Esp is 0. Esp+4 is ebx which is still the address of our nulled out stack space. Esp+8 is 50h(80). Esp+C is 0ah(newline). After setting up the stack, we move some of the arguments into registers⓿. Next we do a test ecx,ecx. Ecx is 50h from the arguments passed in, so it cannot be zero. Always consider though that subroutines may be called in multiple places in the binary with different arguments. You can press x in IDA to see cross references to any function. In this case if ecx was less than or equal to 0 we would just jump to loc_8048C88❶ to unwind the stack and return. Note at before returning we move ebx into eax. Recall eax is the return value of the function. In this case ebx was xored with itself early in the subroutine so the return value is 0. Returning to the main line where ecx is not 0, there is an unconditional jump to ❸. Then we set up arguments for a call to the built in function read❹. Read takes a file descriptor to read from, a pointer to save the data into, and how many bytes to read. The file descriptor is esi which is arg0 which was passed in as 0 to the subroutine. 0 is the file descriptor for stdin. So the data will be read from the user at the terminal. The data is read to a local stack variable and 1 byte is read. Read returns the number of bytes read. Immediately after the call to read we do a test eax,eax on the return value. If the read was successful we jump to ❺. Otherwise we set ebx to 0FFFFFFFFh(-1). This gets put into eax at ❷ and we unwind and return❶. After the jump we move the local variable we read into to eax and ebp into edx. Ebp is 0ah (newline) from the arguments. Cmp al,dl ❻ compares the lowest byte of eax and edx. If they are equal, the user pressed enter, so we jump to the unwind and return. If al and dl are not equal we move the remaining argument (the zeroed out local stack space in main) into edx. Then ❼writes our byte from the user to the beginning of our stack space in main. Ebx was xored with itself at the beginning of the function. Then we add 1 to ebx and compare it to the third argument to the subroutine (50h). If they are equal we jump to ❶ and unwind and return. Otherwise we are back at ❸ to read another byte from the user. So this subroutine reads data one byte at a time from the user until a newline, or a maximum of 50h bytes. The data is stored in main’s stack frame. It returns the number of bytes read. We can rename the function read_from_user. Now let’s return back to main with our number of bytes read. Back in main we compare read_from_user’s return value to 0FFFFFFFFh (-1). If they are equal we jump to ⓿ which checks the stack cookie (gs:14h) and returns. Assuming we were able to read from the user, we pass the pointer to the read data to another subroutine. This next subroutine is a bit longer than the last one. The beginning of the disassembly is shown below. We see our usual function prologue, setting up the stack, etc. At we see a variable s2 being moved into ebx. If we double click on s2 it takes us to the data section. Just to start s2 looks like kind of a mess, but if we use the d key to adjust the data from bytes to double words we end up with something more readable. You can see the beginning of the converted data (along with some unconverted data) below. Basically what we have here is a data structure of commands this operating system knows starting with enable. The structure seems to be name of command, description of command, something, something, and a pointer to command’s function. The somethings we should be able to fill in as we continue our reverse engineering. The C code I used to represent this structure is shown here. For now let’s return to our sub_8048A50 and see how this data structure is used by the program. There’s an instruction in the next bit ⓿ that probably doesn’t make much sense. In the previous instruction we xor esi with itself which will make esi 0. Then at ⓿ we are loading the effective address of the contents to esi+0 into esi, which reads effectively as loading the address of 0+0 into 0, which is about as nonsensical a statement as I have ever read in disassembly. It’s actually Google (and stackoverflow.com) to the rescue on this one. This instruction is actually a NOP or no operation. But it’s faster than a regular NOP instruction and is 4 bytes as opposed to a 1 byte NOP as explained at Stack Overflow. Since “enable” is the first command and that’s the one we want to get to in this exercise, we don’t need to worry about that quite yet. Recall that ebx was set to the beginning of s2 (the string “enable”) previously. At ❶ it is put on the stack and we can strlen on it. As the name implies strlen returns the length of a string argument. Instead of testing if the length was 0, we are going to use the length as an argument ❷ to another built in function strncmp. We call strncmp on our data read from the user, compared with “enable” from our data structure, with the length of “enable” from our strlen as n.
Next we see if strncmp return 0, meaning the two strings are equal (at least for the first n bytes). If the user did not enter “enable” we jump ❸. For now since we are looking for a bug in the enable function, let’s follow the path where strncmp returns 0 and the jnz is not taken. We move the user data into edx and then test if it is zero. The instruction cmovnz ⓿ only moves if the zero flag is set. The test instruction will set the zero flag if edx is 0. We know edx is enable since the strncmp returned 0 and we did not take the jnz above. But remember that this code may be used elsewhere in the program logic (for example in a loop) where edx may be zero. The movzx instruction ❶ takes the first byte in the contents of edi into eax and fills the rest of the register with zeros. So the lowest byte (al) of eax will be the first byte of the user input. Next we compare the byte to 20h which is a space. We know that the first byte of the user input was “e” to get here after the strncmp so the jnz at ❷ is taken. Having verified that the byte is not a space, now we check if it is null. Again, it is “e” so the jump is not taken at ⓿. Then we load the address of edi+1 into eax, effectively moving forward one byte in our user input. Then the non conditional jump is taken at ❶. Here he have another movzx. So we get the byte in eax (the second byte of our user provided string) and put it in edx with zeros. We test if it is null at ⓿. It is “n” the second letter of “enable” in this case, so the jump is not taken. Then we compare the byte to 20h (space). We move forward another byte before we make the jump since our byte is not a space at ❶. Basically we’ve just jumped one instruction above where we started at our last jump. We move our next byte (now the third byte) into eax. Then we loop through again and compare to null and space. There actually is an option in Cisco equipment (and here in Shitsco) to type enable <password> instead of just enable and then respond with the password later when prompted. But let’s follow the path where the user just put in “enable” and we will loop through this piece of code until we reach the null at the end of the string. We will then make the jump at ⓿. This is a very simple block of code. We move eax (the address of the null at the end of our user string) into edi and then make an unconditional jump. Ebp is pointing at the beginning of our commands data structure (at enable). So ebp+0ch (12) is (looking at the data structure piece below) 1⓿. Ebp, normally used as the frame pointer, is being used as a general purpose register here. Here’s another weird looking instruction at ❶. Another option for when we are stumped is to go back to dynamic analysis with a debugger and actually see what’s going on with the registers, etc. around the offending instruction. I’m using the pwndbg plugin for gdb to give me more detailed output about registers, the stack, etc. automatically. When I first started using it it took a little time to get used to, but now I can’t imagine working in gdb without it. So I suggest you check it out. You can however use the usual gdb commands like info registers to view the registers and examine x for examine if you don’t use pwndbg. Grab the memory address of the weird instruction at the left of your IDA Pro output and set a breakpoint in gdb as shown at ⓿. 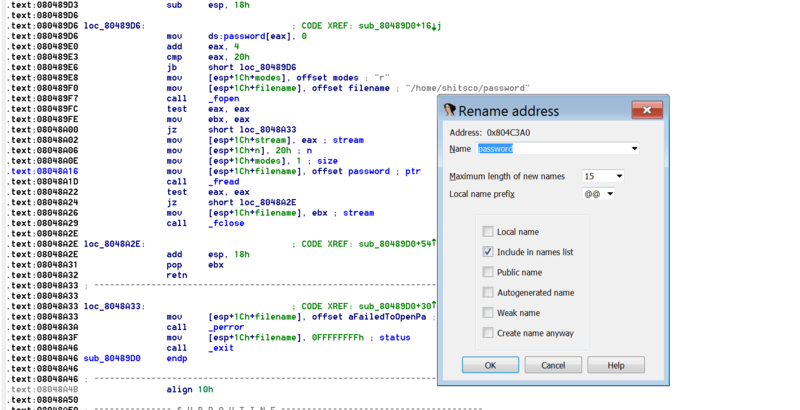 Now run the program and enter “enable” to follow our reverse engineering path. We break at the offending instruction and pwndbg automatically prints out all the info we need. In this case just looking at how the instruction ❶ is written in the code section clears things up for us. The discrepancy is due to GDB and IDA using different disassemblers. So we are loading the effective address of edx * 4 + 4 into eax, a much more sensible notion than that other thing with references to the data section and a 4 just hanging out. As we expected from our analysis edx is 1 ❷, so we get 1 * 4 + 4 = 8 in eax. Coming back to our code (I’ve copied the same code segment here, with the same previous wingdings, just because we’ve done so much in between), we are setting up for a call to the function malloc. Malloc takes one argument, the size, allocates a memory block of that size, and returns a pointer to the new memory block. One thing worth noting is that right below our weird instruction at we are saving edx onto the stack. And just after the call to malloc at ❷ we move the stack variable back into edx. At the beginning of each function we see a reference to cdecl. For example this function starts like this: ; int __cdecl sub_8048A50(char *s1). Cdecl is a calling convention for C programs, and in cdecl the register edx is a volatile register. This means that it’s value can change in a function call such as malloc. So to prevent that stored value from being clobbered, we save it on the stack first. Malloc can then use edx and we still have access to our data and can restore it at ❷. Conversely non-volatile registers will maintain their value across function calls. Different calling conventions have different volatile and non-volatile registers, and functions have to preserve the non-volatile ones so they are returned to the caller in the same state. After restoring edx we compare it to esi. We xored esi with itself near the very beginning of this subroutine, so it is 0 and edx is 1. The jle conditional jump ❸ is taken if edx is less than or equal to esi, which it is not. At ❹ there is another instance of that weird looking nop which we can ignore. In our next code section it looks like we go back to comparing bytes of user input to 20h (space). We saved edi into ebx in the previous code section, where edi was our index into the user input. We had stopped at the null byte at the end of the string “enable”. First we move that byte into edx with zero extension. We know it is not a space in this case so the jnz is taken. Landing from the jump we immediately test if the byte is null. In our case it is so the jz is taken as well. When we land the first thing we do is save eax into edi. We moved ebx into eax in the previous code segment, so now edi is pointing at our null byte at the end of the user provided string “enable”. At ⓿ we move the contents of esp+3Ch+ptr into edx. We saved the eax return value from malloc into this stack location previously, so this should be the pointer to our malloced 8 bytes. Then we move the address into eax (esi is still 0). We set the contents of our malloced memory to 0❶. Actually oddly we do it twice, but since we are not moving eax between them, this is functionally another nop. Then we move ds:dword_804C3C0 into eax. At the very beginning of main we had the instruction mov ds:dword_804C3C0, 0 and have not changed it since. Ebp is still set to our command data structure’s entry for the enable command, so ebp+8 is 0 as shown below at ❷. 0 is in fact less than or equal to 0, so the jle ❸ is taken. It is worth noting what happens if the jump is not taken. Variables are restored, the stack is unwound, and we return to main. It seems a reasonable assumption that ebp+0ch is the number of arguments and ebp+8 is whether this is a privileged command. If we do not have elevated privileges and attempt to execute a privileged command we return to main. Since enable is all about getting those elevated privileges, we are allowed to continue. After the jump we set up our argument for our next function call. We move our malloced memory (with null in it since we have no user provided arguments to pass) and then put it on the stack. The call to the contents of ebp+10h matches up with ❶ in our data structure above. This should take us to the function for enable. Since we only reverse engineered one specific path of this subroutine, we will save the C code for a later exercise. Finally we have reach our offending function. Recall that when we ran the program, when we entered the password “georgia” at the prompt in this function we saw some additional memory printed out. It appears to be garbage, but perhaps we can use it to our advantage. Remember that we sent in a null argument, as we will provide our password guess at the prompt. We move the pointer to the argument value into esi at ⓿. Then we move the contents of esi into eax at ❶. Then we test if eax is null. Since in our case it is the jump if zero❷ is taken. Since we did not enter a password as an argument to enable, we are now prompted for a password with printf⓿. Since there is not a new line at the end of the prompt we need to use fflush]❶ on stdout to force the prompt to print. We saw this same setup for the command prompt in main earlier in this walkthrough. Next we are setting up another call to the subroutine we renamed read_from_user. If you did not use n to rename the function, you will see a call to sub_8048C30. We already walked through the disassembly for read_from_user including creating a C code equivalent, which you can refer back to. The function prototype is shown above. So we are reading from stdin (file descriptor 0), into the enable function’s stack memory, at most 20h (32) bytes, and stopping at the 0ah (newline) character. So after read_from_user returns we should have a password attempt in ebx (and the contents of esp+4ch+s2) on the stack. Then we take the unconditional jump at ❷. We should be zeroing in on our bug. After the jump we take our password read from the user and compare it to the password value from the data section that we read from a file in read_password function just after the program started. If you did not rename the variable in the data section line ⓿ will read mov [esp+4Ch+dest], offset dword_804C3A0 ; s1. We saw a very similar function (strncmp) when we were comparing the user input for the command to our commands in our data structure. The only difference for strcmp (no n) is that the length is not set. Like strncmp, strcmp “returns an integer less than, equal to, or greater than zero if s1 is found, respectively, to be less than, to match, or be greater than s2.” There is just no hard stop at n bytes for strcmp. The result of strcmp is saved on the stack at ❶. If strcmp returns 0 the password guess is correct and the jump zero at ❷ is taken. However, in our dynamic analysis we put in an incorrect password, so let’s not take the jump. We use printf ❸ to print out the string “Nope. The password isn’t %s\n” where %s is ebx or our password guess read from the user. This is where our memory leak occurs. Clearly there is not a null at the end of our password guess in ebx to tell printf to stop reading the string. Looking back at read_from_user, after a byte is read into eax, it is compared with the lowest byte of edx (dl) which is our stop character (0ah). If they match, a jump is taken. After the jump, the stack is unwound, and read_from_user returns. The function does not add a null byte at the end of the string. Recall that read_from_user was called in main to get the user’s command choice. In main, right before we set up the arguments for read_from_user, we use the rep stosd instruction to store the dword eax at edi, ecx times. Esi is xored with itself a few lines before at .text:08048836 and is now moved into eax. Ebx was set to an address in main’s stack frame with lea ebx, [esp+1Ch] earlier in main and is now moved into edi. So this writes null into esp+1ch 14h (20). Here in the enable function we read into ebx. Ebx points to the stack location esp+4ch+s2. But esp+4ch+s2 is not zeroed out before the call to read_from_user. Thus there is stale stack data still present after the user’s data that printf may pick up and print out as it blindly waits for a null to signify the end of the string. Thus our vulnerability is that read_from_user expects to get nulled out memory to write into, but the stack memory passed by the enable function is not zeroing out the stack memory before it is passed to read_from_user. Of course this is only half the battle. We now need some way to turn junk printed out to the terminal into a working exploit. It would be quite nice if the correct password was saved on the stack just after our user password guess. Use ctrl+k to view the stack frame for the enable function. -0000004C ; Use data definition commands to create local variables and function arguments. -0000004C ; Two special fields ” r” and ” s” represent return address and saved registers. Unfortunately, looking at the stack layout the password from the data section is stored at ⓿. What we do have right after s2 (the user data) is var_14 ❶. Var_14 is the return value from strcmp. So basically if they match it returns 0, if at the first character that deviates s1’s character is less than s2’s it returns a negative integer value, and if s1’s deviating character is greater than s2’s it returns a positive integer. I wonder if we can use this value to basically brute force the password. Let’s write a little python script to automatically run Shitsco, get to the vulnerability in enable and read the value of Var_14 just after s2 on the stack. To help us write our exploit I’ve used a python library called pwntools which is incredibly helpful for CTF challenges. Information on how to install pwntools is included in the github Readme section at the link provided. We have a variable guess ⓿ where we will keep our experimental value to test what integer value is in var_14 for different inputs. We know (since we set the password up on our system at the beginning of this exercise) that the first letter of the password is f. Thus we expect that if we send an a (and some padding) that var_14 should be a positive integer since f (66h) from s1 is greater than a (61h) from s2. We run the shitsco binary with the process command and receive data from the process until we get the prompt for a command❶. Then we send our enable command and receive data until we get the end of the prompt for a password❷. Now we want to send our guess (a) with padding out to the end of our 32 byte stack space for s2❷. I chose space (0x20) for the padding because it is the lowest hex value for a printable character. Assuming all of the password characters are printable the space will always be less than or equal to the password character. After we send the password we expect to receive a line back from the binary, the “Nope. The password isn’t…” Having captured that line I want var_14 in its own variable. It took a little guess and check to get the offset into that string but we know we have 32 bytes for s2 and counting the characters in the Nope… comes out at 26. Thus 32+26 = 58 so var_14 just after that should be at offset 59 in the string❸. Now we want to print the value’s integer representation out as part of a string at ❹. Run the script with the Python interpreter. As expected Var_14 is a positive integer ⓿. Now let’s see what happens if we set the first character of our password to a value greater than s1. We expect from the man page that we will get a negative integer in var_14. Set guess equal to “g” at the top of the python script and leave the rest the same. This time we got \xff\xff\xff\xff in var_14. Though our ordinal cast in python shows that as 255 ⓿, that is also -1 when interpreted as a signed integer. Finally, let’s examine what happens if we get a character correct. Set guess to f and run the script again. You may have expected var_14 to be 0 since f=f. But finding that the first character of each string were equal, strcmp moved onto the next character and compared o (6Fh) to space (20h). So s1 is greater than s2 and we get a positive integer ⓿ again. Thus we should be able to loop through the printable characters and compare them to the first character of the password. Until we reach the correct character we will get back a 1. Then when we get the character correct the comparison will move to comparing the next character to space. 20h is less than any other printable character, so we will know we have found a correct character when we get 255 (-1) back from the script. This basically gives you an oracle to test each character of the password individually. Then we can record the correct character and start looping on the next character until we get the full password and authenticate with Shitsco. This new script starts out the same as the previous by running Shitsco and receiving data until the $ prompt for a command. We add in some new variables: done=0 will set to 1 when we successfully authenticate. This will be an indicator that the script should stop adding more characters to the password. correctpassword= “” is an empty string to which we will add characters as we find them to be correct in our loop. mychar is another empty string we will use for holding potential correct characters. Then we enter a while loop until done is set to 1. Each time we exit the inner loop ⓿ we should have added on a new character to correctpassword. So we print it out to the user at each pass. Our inner for loops through the printable characters. We send the enable command, receive until the password prompt, and send in our password guess ❶. The guess is made up of any previously discovered correct characters, our current guess from string.printable, and spaces for padding out to the end of s2’s 32 bytes on the stack. Just like in our last script we receive the response and grab offset 59 which is var_14. If var_14 is 1 ⓿ either we are still too low of a value for our guess, or we have the correct character and the 1 is our space being less than the next character of the password. We hold our current guess in mychar for now and continue to the next iteration of the for loop. If it is 255 (-1) we have found a correct character. Either our previous guess (stored in mychar) was correct and we have now gone past it, or we have found the entire password and our space (0x20) is greater than null (0x00) at the end of the password. We send enable followed by correctpassword followed by x (our current character guess). If the line we receive back includes “Successful” we know this is the correct password. We didn’t get to that part of the enable function with our reverse engineering, but we can find the string for successful authentication at 0x080492B8 as shown below. If correctpassword + x authenticated we fill in the last character of the password and set done equal to 1 to stop our outer loop as well. If not then we try correctpassword + mychar (the value from the previous loop). Same deal, if we get “Successful” in our returned string, we update correctpassword to include mychar, set done equal to 1, and break out of the for loop. Otherwise we have just found the next character of the password and need to continue guessing the remaining character. Just add mychar to the end of correctpassword and break out of the for loop. Since we are not at the end of the password we did not set done to 1. Once we guess the complete password we have administrative access on the binary. I used the p.interactive() command in my Python code from pwntools to interact with the process. Now that I have admin access (and the # for the prompt) if we run the ? command, we see the command flag is available. If this were the real CTF challenge, a flag would be in place and we could use this command to score our points in the game. Moving on to sub_8048D40 it is easy to spot the flag file being opened for reading. If we create a file at /home/shitsco/flag (like we did for the password file at the beginning of this exercise) we can emulate using our admin access to get the flag. The root cause of this issue was that the user input for the password is not null terminated which allowed us to leak stack data. The return value from strcmp function between the correct password and user provided password is on the stack after the user supplied password. We used this leaked info as an oracle to brute force the correct password character by character. Strings without a null terminator leading to memory leaks are a common security issue. In this case we used the leak specifically to the binary, but in many cases memory leaks can be used in tandem with other bugs to bypass address space layout randomization (ASLR). As mentioned briefly at the beginning of this post, there is actually another issue in this binary with the set/show functions. We will follow that path in the next post.